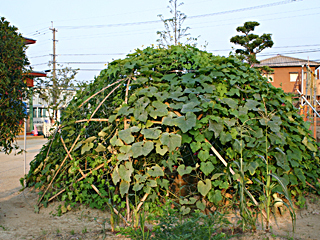 STARDOME, STARDOME, the most excellent bamboo dome. Towards a Lightful and Flexible Future. Buckminster Fuller, mathematician, architect, inventor, philosopher, is known for his thoughts about the earth as being a limited space for living creatures as well as for having spread the phrase �gSpaceship Earth�h. He studied insightfully the prospect of architecture in the future and lifestyle design. He introduces various ideas about creating maximum effect out of minimum materials, based upon his idea of �gdoing the most with the least�h. The more we get to know about his theory on geometrics and his background in philosophy, the more attracted we get to him. 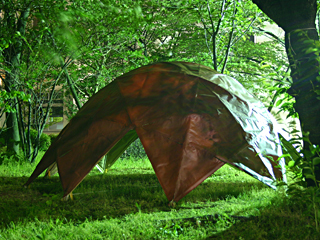 A new, light type of house that can be moved around; a space where everyone can get their �gprivate sky�h; couldn't such a great dome be made out of materials used in daily life? Fuller's dome is a beautiful hemisphere that can be made by combining some small surfaces together. However, it requires complicated calculations to transfer spherical surface onto plane surfaces, so we decided to go back to the drawing board and reconsider his idea. 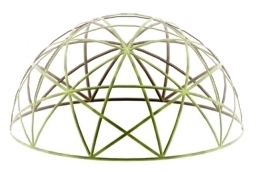 It had to be possible to make a dome following simpler principles while sticking to spherical calculations. 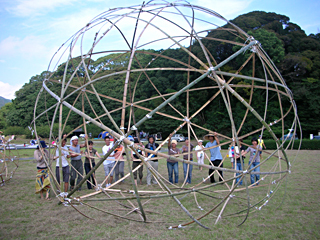 Surely, a beautiful, stable spherical structure can be created using bamboos, which can be bent by having stress laid on them. We were at a loss how to build a sufficiently strong and stable dome. It is only after multiple trials that we hit upon a hint, hidden in an exhibition entitled �gMandala Deities of Tibetan and Nepalese Buddhism�h held by the National Museum of Ethnology. The image of a new dome suddenly took form into ours minds, like a combination of the world of Buddhas around Sumi Mountain and the geometrical patterns of the Mandala. That was the very dome we were after. Let us set FS frames so that the points dividing the sphere into three equal parts will be the vertex of each pentagram. �gBeautiful stars�h will take form where all the vertexes of the icosidodecahedron are joined together. 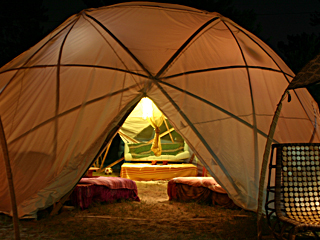 It was a simple and well-balanced dome. 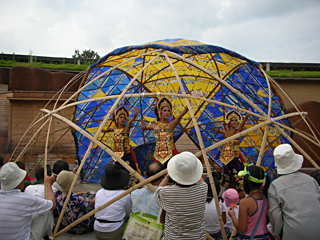 It is thus on July 2003 that a star dome with 6 stars was finally completed. 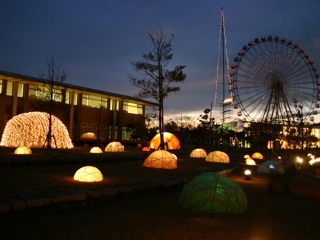 We, at the Kyushu Fieldwork Society hope that many people will experience the beautiful space created by the STARDOME. We open all our knowledge at this STARDOME official site. 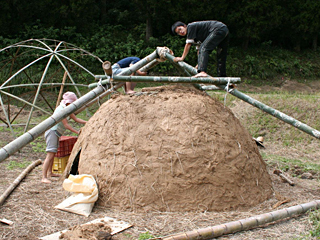 We hope that people will not merely think of the STARDOME as a practical way of using bamboo but also as a new way of living for mankind. It is not a profound but rather a light and flexible way of thinking. It is not a life for settling down but one for freely moving around. The STARDOME will surely tell you: �gLook, here is your private sky!�h, thus bringing into shape the very future that Fuller had dreamed of. You can do with STARDOME.